Neon Night is a 2 km and 5 km non-competitive fun run/walk for all ages and abilities, that takes place at night. 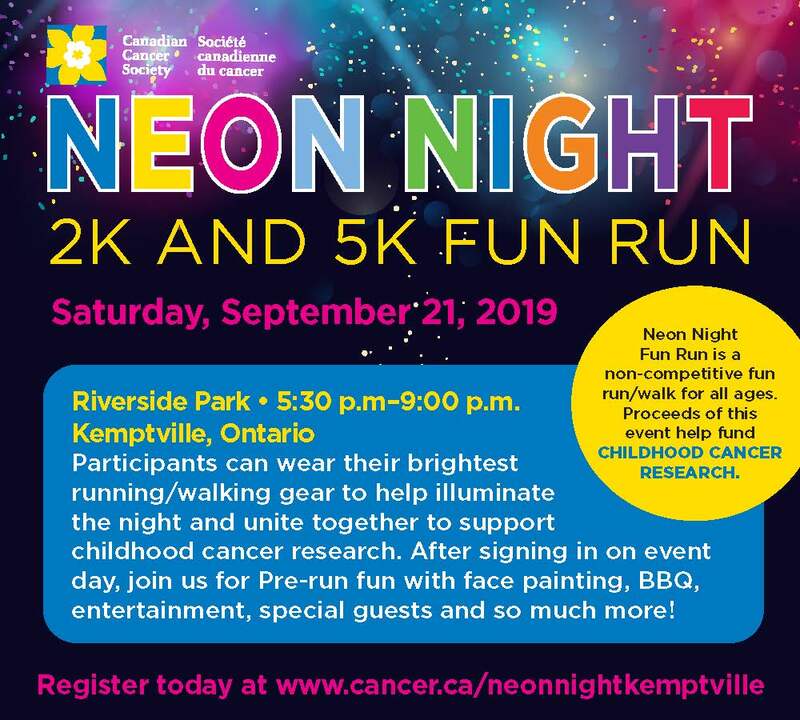 Neon Night in Kemptville, is on Saturday, September 21 at Riverside Park in Kemptville. This is our 6th year raising funds for childhood cancer research. Last year, we had over 1100 participants and to date we have raised over $350,000 for childhood cancer research. Participants are encouraged to wear their brightest running/walking gear (NEON, glow sticks etc.) to help illuminate the night; all in the fight against childhood cancer. After signing in on event day, join us for a Pre-run fun with face painting, BBQ, entertainment, special guests and so much more! The route will be glowing with fun as participants all decked out in neon walk/run through the streets of Kemptville. All participants will receive a medal and a glow item. very participant who registers before September 1, 2019 will receive the t-shirt size specified in their registration. If you register after September 1, t-shirt isn’t guaranteed and limited sizes will be available on event day. It’s almost time to light up the night! Neon Night has a record breaking year in a record breaking heat wave!